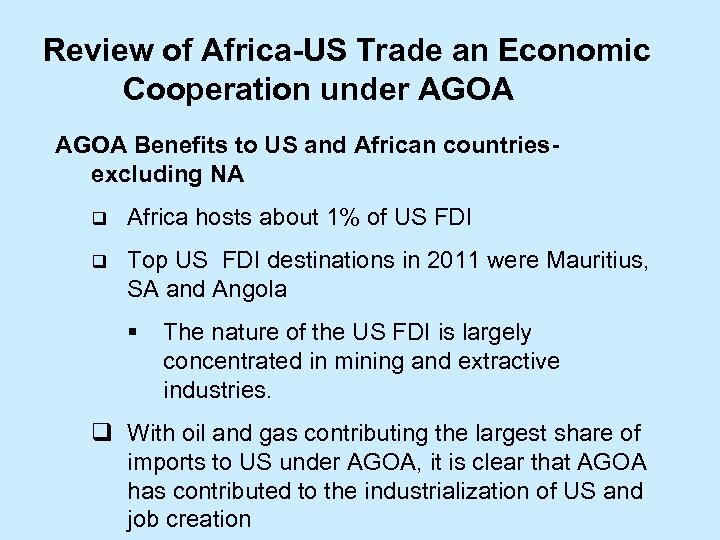 Introduction • AGOA is a United States Trade Act that significantly enhances U. S. market access for Sub Saharan Africa. • In May 2000 the U. 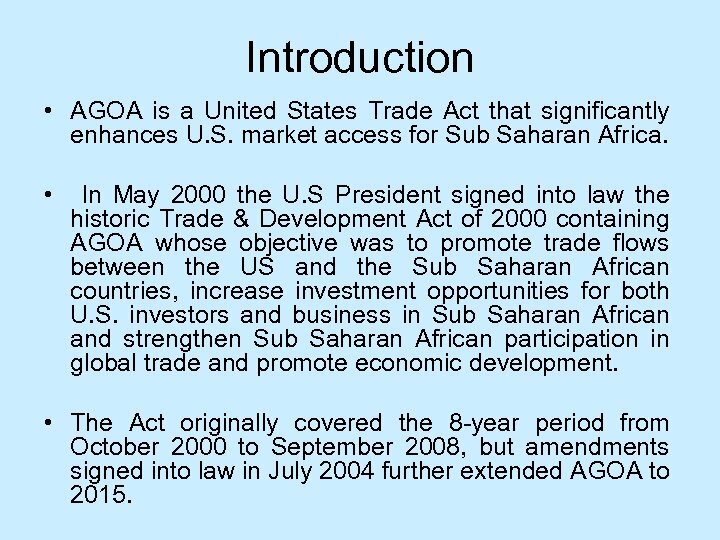 S President signed into law the historic Trade & Development Act of 2000 containing AGOA whose objective was to promote trade flows between the US and the Sub Saharan African countries, increase investment opportunities for both U. S. investors and business in Sub Saharan African and strengthen Sub Saharan African participation in global trade and promote economic development. 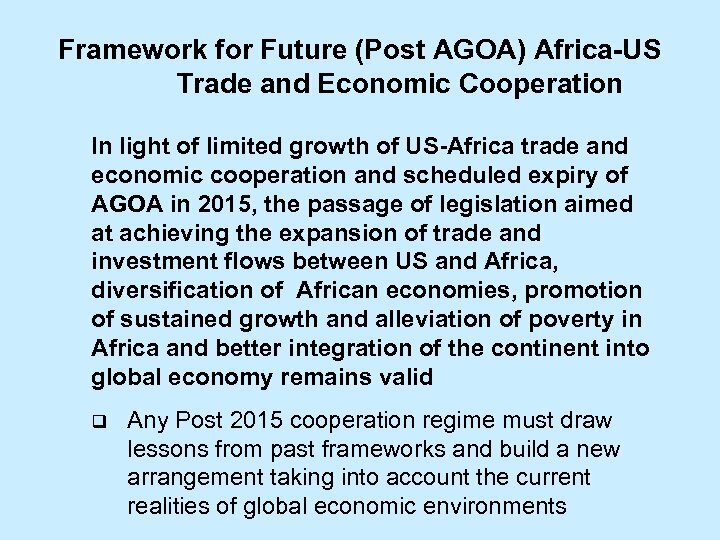 • The Act originally covered the 8 -year period from October 2000 to September 2008, but amendments signed into law in July 2004 further extended AGOA to 2015. 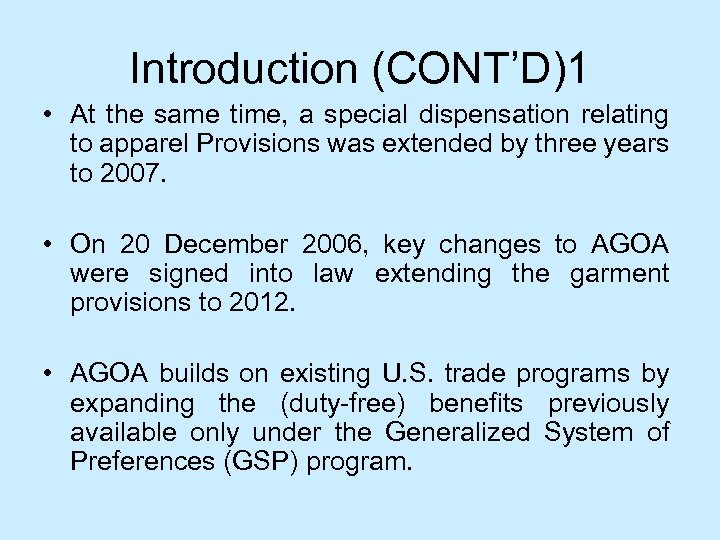 Introduction (CONT’D)1 • At the same time, a special dispensation relating to apparel Provisions was extended by three years to 2007. 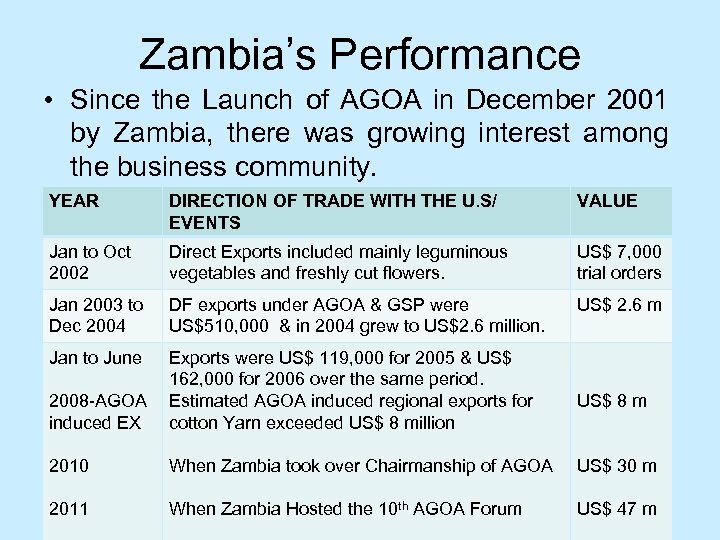 • On 20 December 2006, key changes to AGOA were signed into law extending the garment provisions to 2012. 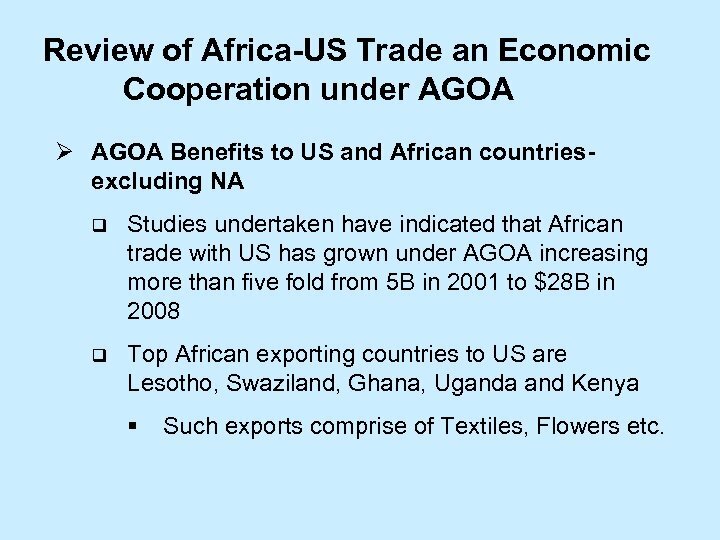 • AGOA builds on existing U. S. trade programs by expanding the (duty-free) benefits previously available only under the Generalized System of Preferences (GSP) program. 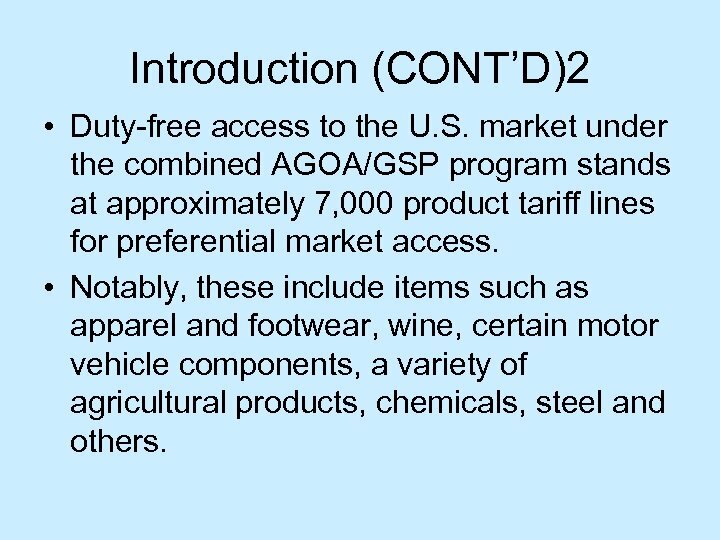 Introduction (CONT’D)2 • Duty-free access to the U. S. market under the combined AGOA/GSP program stands at approximately 7, 000 product tariff lines for preferential market access. 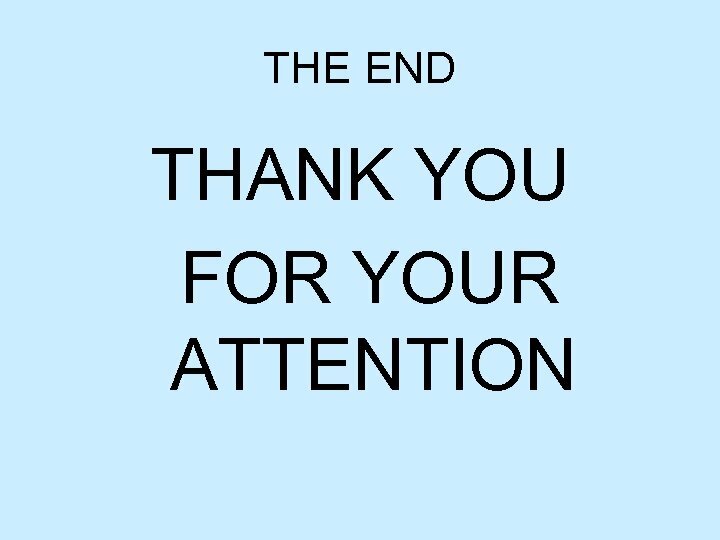 • Notably, these include items such as apparel and footwear, wine, certain motor vehicle components, a variety of agricultural products, chemicals, steel and others. 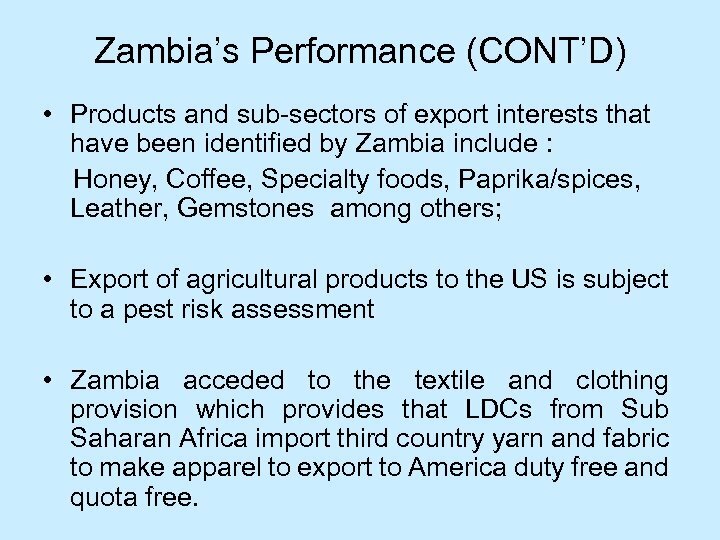 Zambia’s Performance (CONT’D) • Products and sub-sectors of export interests that have been identified by Zambia include : Honey, Coffee, Specialty foods, Paprika/spices, Leather, Gemstones among others; • Export of agricultural products to the US is subject to a pest risk assessment • Zambia acceded to the textile and clothing provision which provides that LDCs from Sub Saharan Africa import third country yarn and fabric to make apparel to export to America duty free and quota free. 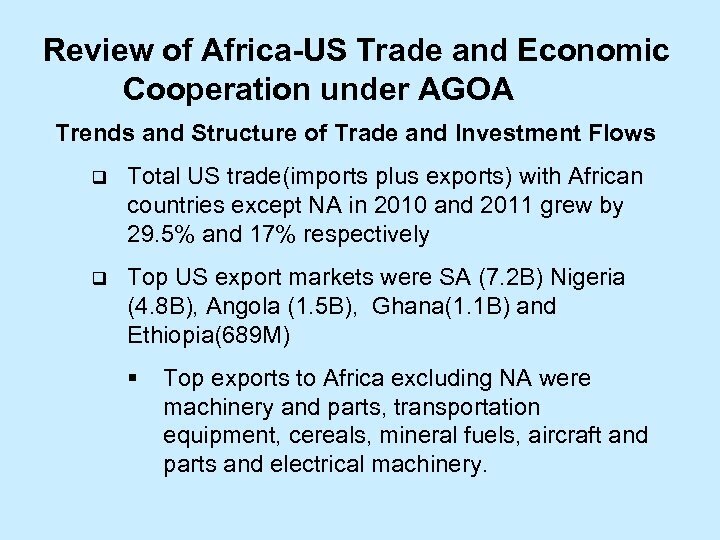 Review of Africa-US Trade and Economic Cooperation under AGOA Trends and Structure of Trade and Investment Flows q Total US trade(imports plus exports) with African countries except NA in 2010 and 2011 grew by 29. 5% and 17% respectively q Top US export markets were SA (7. 2 B) Nigeria (4. 8 B), Angola (1. 5 B), Ghana(1. 1 B) and Ethiopia(689 M) § Top exports to Africa excluding NA were machinery and parts, transportation equipment, cereals, mineral fuels, aircraft and parts and electrical machinery. 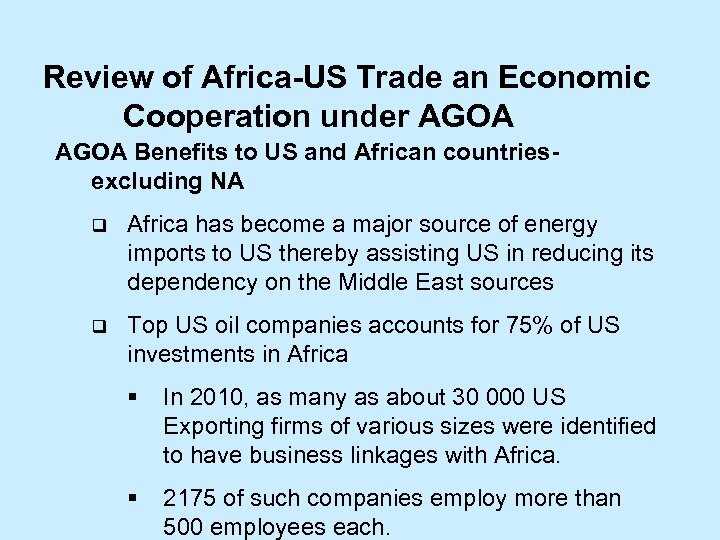 Review of Africa-US Trade an Economic Cooperation under AGOA Benefits to US and African countriesexcluding NA q Africa has become a major source of energy imports to US thereby assisting US in reducing its dependency on the Middle East sources q Top US oil companies accounts for 75% of US investments in Africa § In 2010, as many as about 30 000 US Exporting firms of various sizes were identified to have business linkages with Africa. § 2175 of such companies employ more than 500 employees each. 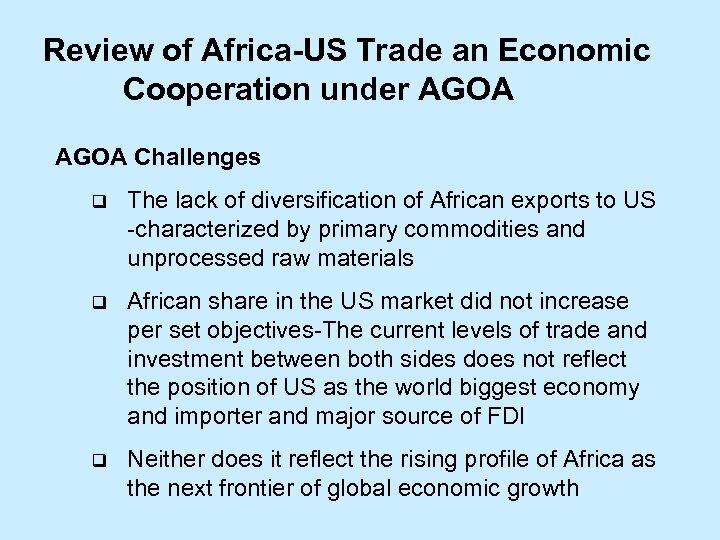 Review of Africa-US Trade an Economic Cooperation under AGOA Ø AGOA Benefits to US and African countriesexcluding NA q Studies undertaken have indicated that African trade with US has grown under AGOA increasing more than five fold from 5 B in 2001 to $28 B in 2008 q Top African exporting countries to US are Lesotho, Swaziland, Ghana, Uganda and Kenya § Such exports comprise of Textiles, Flowers etc. 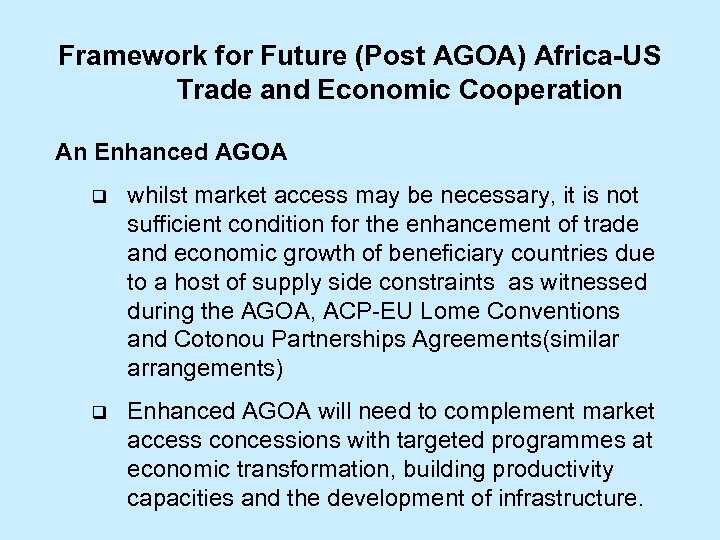 Framework for Future (Post AGOA) Africa-US Trade and Economic Cooperation An Enhanced AGOA q whilst market access may be necessary, it is not sufficient condition for the enhancement of trade and economic growth of beneficiary countries due to a host of supply side constraints as witnessed during the AGOA, ACP-EU Lome Conventions and Cotonou Partnerships Agreements(similar arrangements) q Enhanced AGOA will need to complement market access concessions with targeted programmes at economic transformation, building productivity capacities and the development of infrastructure. 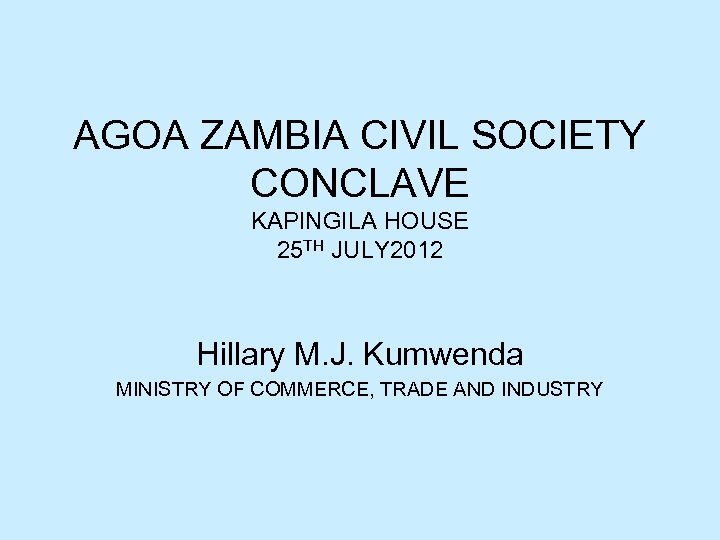 Strategies/ Initiatives pursued by Zambia • The Zambian & U. 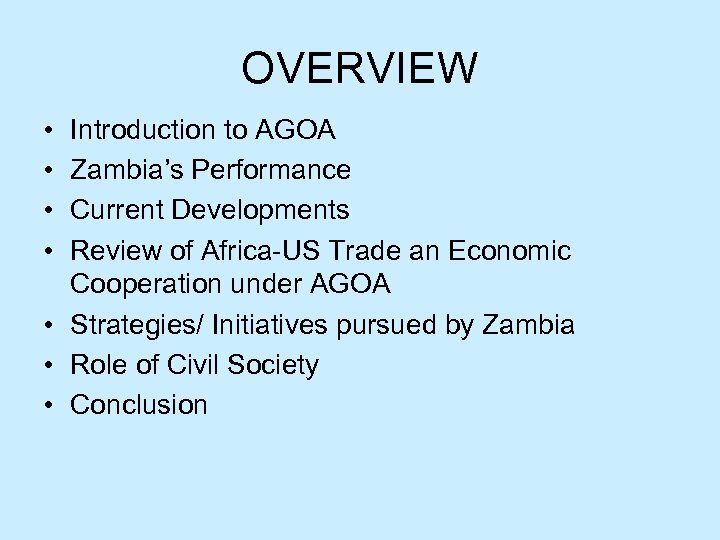 S & Governments decided to improve both the trade and investment outlook by working together under the framework of the Bilateral Working Group on Trade, Invst & AGOA. 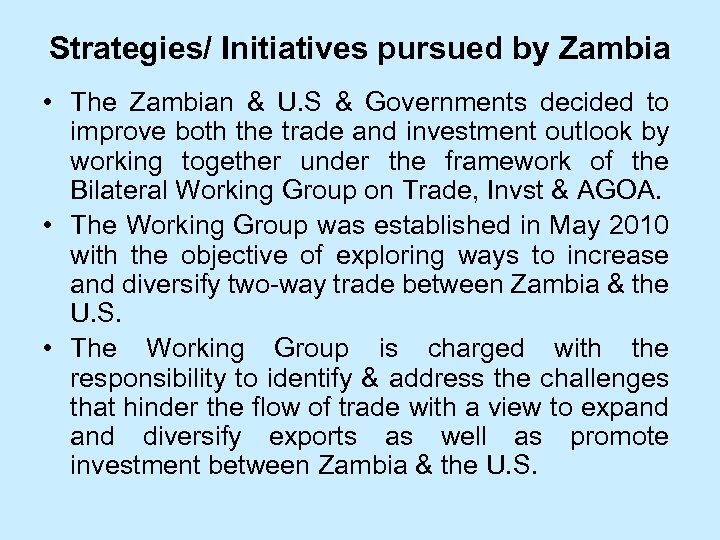 • The Working Group was established in May 2010 with the objective of exploring ways to increase and diversify two-way trade between Zambia & the U. S. • The Working Group is charged with the responsibility to identify & address the challenges that hinder the flow of trade with a view to expand diversify exports as well as promote investment between Zambia & the U. S.
Role of Civil Society • Civil Societies represent a special group of people. 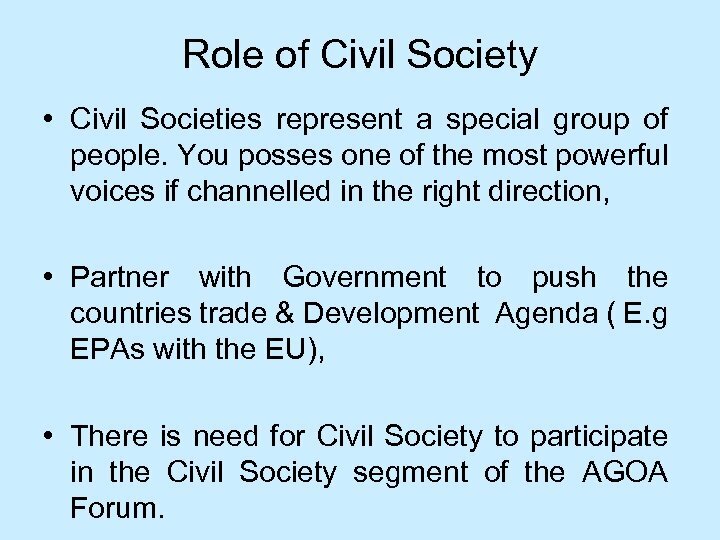 You posses one of the most powerful voices if channelled in the right direction, • Partner with Government to push the countries trade & Development Agenda ( E. g EPAs with the EU), • There is need for Civil Society to participate in the Civil Society segment of the AGOA Forum. 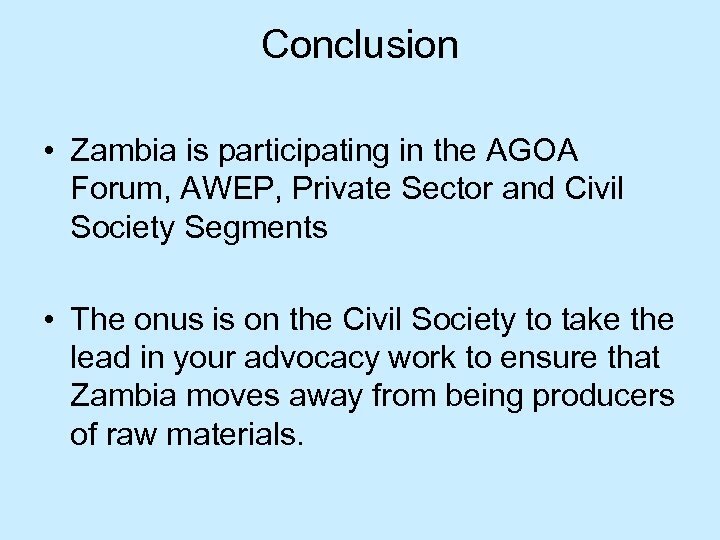 Conclusion • Zambia is participating in the AGOA Forum, AWEP, Private Sector and Civil Society Segments • The onus is on the Civil Society to take the lead in your advocacy work to ensure that Zambia moves away from being producers of raw materials.